Ron Paul is a member of the U.S. Congress (R) representing the 14th District of Texas. Since my 2008 campaign for the presidency I have often been asked, “How would a constitutionalist president go about dismantling the welfare-warfare state and restoring a constitutional republic?” This is a very important question, because without a clear road map and set of priorities, such a president runs the risk of having his pro-freedom agenda stymied by the various vested interests that benefit from big government. Of course, just as the welfare-warfare state was not constructed in 100 days, it could not be dismantled in the first 100 days of any presidency. While our goal is to reduce the size of the state as quickly as possible, we should always make sure our immediate proposals minimize social disruption and human suffering. Thus, we should not seek to abolish the social safety net overnight because that would harm those who have grown dependent on government-provided welfare. Instead, we would want to give individuals who have come to rely on the state time to prepare for the day when responsibility for providing aide is returned to those organizations best able to administer compassionate and effective help―churches and private charities. No matter what the president wants to do, most major changes in government programs would require legislation to be passed by Congress. Obviously, the election of a constitutionalist president would signal that our ideas had been accepted by a majority of the American public and would probably lead to the election of several pro-freedom congressmen and senators. Furthermore, some senators and representatives would become “born again” constitutionalists out of a sense of self-preservation. Yet there would still be a fair number of politicians who would try to obstruct our freedom agenda. Thus, even if a president wanted to eliminate every unconstitutional program in one fell swoop, he would be very unlikely to obtain the necessary support in Congress. Yet a pro-freedom president and his legislative allies could make tremendous progress simply by changing the terms of the negotiations that go on in Washington regarding the size and scope of government. Today, negotiations over legislation tend to occur between those who want a 100 percent increase in federal spending and those who want a 50 percent increase. Their compromise is a 75 percent increase. With a president serious about following the Constitution, backed by a substantial block of sympathetic representatives in Congress, negotiations on outlays would be between those who want to keep funding the government programs and those who want to eliminate them outright―thus a compromise would be a 50 percent decrease in spending! While a president who strictly adheres to the Constitution would need the consent of Congress for very large changes in the size of government, such as shutting down cabinet departments, he could use his constitutional authority as head of the executive branch and as commander in chief to take several significant steps toward liberty on his own. The area where the modern chief executive has greatest ability to act unilaterally is in foreign affairs. Unfortunately, Congress has abdicated its constitutional authority to declare wars, instead passing vague “authorization of force” bills that allow the president to send any number of troops to almost any part of the world. The legislature does not even effectively use its power of the purse to rein in the executive. Instead, Congress serves as little more than a rubber stamp for the president’s requests. Domestically, the president can use his authority to set policies and procedures for the federal bureaucracy to restore respect for the Constitution and individual liberty. For example, today manufacturers of dietary supplements are subject to prosecution by the Food and Drug Administration (FDA) or Federal Trade Commission (FTC) if they make even truthful statements about the health benefits of their products without going through the costly and time-consuming procedures required to gain government approval for their claims. A president can put an end to this simply by ordering the FDA and FTC not to pursue these types of cases unless they have clear evidence that the manufacturer’s clams are not true. Similarly, the president could order the bureaucracy to stop prosecuting consumers who wish to sell raw milk across state lines. A crucial policy that a president could enact to bring speedy improvements to government is ordering the bureaucracy to respect the 10th Amendment and refrain from undermining state laws. We have already seen a little renewed federalism with the current administration’s policy of not prosecuting marijuana users when their use of the drug is consistent with state medical-marijuana laws. A constitutionalist administration would also defer to state laws refusing compliance with the REAL ID act and denying federal authority over interstate gun transactions. None of these actions repeals a federal law; they all simply recognize a state’s primary authority, as protected by the 10th amendment, to set policy in these areas. In fact, none of the measures I have discussed so far involves repealing any written law. They can be accomplished simply by a president exercising his legitimate authority to set priorities for the executive branch. And another important step he can take toward restoring the balance of powers the Founders intended is repealing unconstitutional executive orders issued by his predecessors. Executive orders are a useful management tool for the president, who must exercise control over the enormous federal bureaucracy. However, in recent years executive orders have been used by presidents to create new federal laws without the consent of Congress. As President Clinton’s adviser Paul Begala infamously said, “stroke of the pen, law of the land, pretty cool.” No, it is not “pretty cool,” and a conscientious president could go a long way toward getting us back to the Constitution’s division of powers by ordering his counsel or attorney general to comb through recent executive orders so the president can annul those that exceed the authority of his office. If the President believed a particular Executive Order made a valid change in the law, then he should work with Congress to pass legislation making that change. Only Congress can directly abolish government departments, but the president could use his managerial powers to shrink the federal bureaucracy by refusing to fill vacancies created by retirements or resignations. This would dramatically reduce the number of federal officials wasting our money and taking our liberties. One test to determine if a vacant job needs to be filled is the “essential employees test.” Whenever D.C. has a severe snowstorm, the federal government orders all “non-essential” federal personal to stay home. If someone is classified as non-essential for snow-day purposes, the country can probably survive if that position is not filled when the jobholder quits or retires. A constitutionalist president should make every day in D.C. like a snow day! A president could also enhance the liberties and security of the American people by ordering federal agencies to stop snooping on citizens when there is no evidence that those who are being spied on have committed a crime. Instead, the president should order agencies to refocus on the legitimate responsibilities of the federal government, such as border security. He should also order the Transportation Security Administration to stop strip-searching grandmothers and putting toddlers on the no-fly list. The way to keep Americans safe is to focus on real threats and ensure that someone whose own father warns U.S. officials he’s a potential terrorist is not allowed to board a Christmas Eve flight to Detroit with a one-way ticket. "'A crucial policy that a president could enact to bring speedy improvements to government is ordering the bureaucracy to respect the 10th Amendment and refrain from undermining state laws." Perhaps the most efficient step a president could take to enhance travel security is to remove the federal roadblocks that have frustrated attempts to arm pilots. Congress created provisions to do just that in response to the attacks of September 11, 2001. However, the processes for getting a federal firearms license are extremely cumbersome, and as a result very few pilots have gotten their licenses. A constitutionalist in the Oval Office would want to revise those regulations to make it as easy as possible for pilots to get approval to carry firearms on their planes. Unconstitutional government spending, after all, is doubly an evil: it not only means picking the taxpayer’s pocket, it also means subverting the system of limited and divided government that the Founders created. Just look at how federal spending has corrupted American education. Eliminating federal involvement in K–12 education should be among a constitutionalist president’s top domestic priorities. The Constitution makes no provision for federal meddling in education. It is hard to think of a function less suited to a centralized, bureaucratic approach than education. The very idea that a group of legislators and bureaucrats in D.C. can design a curriculum capable of meeting the needs of every American schoolchild is ludicrous. The deteriorating performance of our schools as federal control over the classroom has grown shows the folly of giving Washington more power over American education. President Bush’s No Child Left Behind law claimed it would fix education by making public schools “accountable.” However, supporters of the law failed to realize that making schools more accountable to federal agencies, instead of to parents, was just perpetuating the problem. In the years since No Child Left Behind was passed, I don’t think I have talked to any parent or teacher who is happy with the law. Therefore, a constitutionalist president looking for ways to improve the lives of children should demand that Congress cut the federal education bureaucracy as a down payment on eventually returning 100 percent of the education dollar to parents. Traditionally, the battle to reduce the federal role in education has been the toughest one faced by limited-government advocates, as supporters of centralized education have managed to paint constitutionalists as “anti-education.” But who is really anti-education? Those who wish to continue to waste taxpayer money on failed national schemes, or those who want to restore control over education to the local level? When the debate is framed this way, I have no doubt the side of liberty will win. When you think about it, the argument that the federal government needs to control education is incredibly insulting to the American people, for it implies that the people are too stupid or uncaring to educate their children properly. Contrary to those who believe that only the federal government can ensure children’s education, I predict a renaissance in education when parents are put back in charge. The classroom is not the only place the federal government does not belong. We also need to reverse the nationalization of local police. Federal grants have encouraged the militarization of law enforcement, which has led to great damage to civil liberties. Like education, law enforcement is inherently a local function, and ending programs such as the Byrne Grants is essential not just to reducing federal spending but also to restoring Americans’ rights. Obviously, a president concerned with restoring constitutional government and fiscal responsibility would need to address the unstable entitlement situation, possibly the one area of government activity even more difficult to address than education. Yet it is simply unfair to continue to force young people to participate in a compulsory retirement program when they could do a much better job of preparing for their own retirements. What is more, the government cannot afford the long-term expenses of entitlements, even if we were to reduce all other unconstitutional foreign and domestic programs. As I mentioned in the introduction to this article, it would be wrong simply to cut these programs and throw those who are dependent on them “into the streets.” After all, the current recipients of these programs have come to rely on them, and many are in a situation where they cannot provide for themselves without government assistance. The thought of people losing the ability to obtain necessities for them because they were misled into depending on a government safety net that has been yanked away from them should trouble all of us. However, the simple fact is that if the government does not stop spending money on welfare and warfare, America may soon face an economic crisis that could lead to people being thrown into the street. Therefore, a transition away from the existing entitlement scheme is needed. This is why a constitutionalist president should propose devoting half of the savings from the cuts in wars and other foreign spending, corporate welfare, and unnecessary and unconstitutional bureaucracies to shoring up Social Security, Medicare, and Medicaid and providing enough money to finance government’s obligations to those who are already stuck in the system and cannot make alternative provisions. This re-routing of spending would allow payroll taxes to be slashed. The eventual goal would be to move to a completely voluntary system where people only pay payroll taxes into Social Security and Medicare if they choose to participate in those programs. Americans who do not want to participate would be free not to do so, but they would forgo any claim to Social Security or Medicare benefits after retirement. Some people raise concerns that talk of transitions is an excuse for indefinitely putting off the end of the welfare state. I understand those concerns, which is why a transition plan must lay out a clear timetable for paying down the debt, eliminating unconstitutional bureaucracies, and setting a firm date for when young people can at last opt out of the entitlement programs. A final area that should be front and center in a constitutionalist’s agenda is monetary policy. The Founders obviously did not intend for the president to have much influence over the nation’s money―in fact, they never intended any part of the federal government to operate monetary policy as it defined now. However, today a president could play an important role in restoring stability to monetary policy and the value of the dollar. To start, by fighting for serious reductions in spending, a constitutionalist administration would remove one of the major justifications for the Federal Reserve’s inflationary policies, the need to monetize government debt. There are additional steps a pro-freedom president should pursue in his first term to restore sound monetary policy. He should ask Congress to pass two pieces of legislation I have introduced in the 110th Congress. The first is the Audit the Fed bill, which would allow the American people to learn just how the Federal Reserve has been conducting monetary policy. The other is the Free Competition in Currency Act, which repeals legal tender laws and all taxes on gold and silver. This would introduce competition in currency and put a check on the Federal Reserve by ensuring that people have alternatives to government-produced fiat money. All of these measures will take a lot of work―a lot more than any one person, even the president of the United States, can accomplish by himself. In order to restore the country to the kind of government the Founders meant for us to have, a constitutionalist president would need the support of an active liberty movement. Freedom activists must be ready to pressure wavering legislators to stand up to the special interests and stay the course toward freedom. Thus, when the day comes when someone who shares our beliefs sits in the Oval Office, groups like Young Americans for Liberty and Campaign for Liberty will still have a vital role to play. No matter how many pro-freedom politicians we elect to office, the only way to guarantee constitutional government is through an educated and activist public devoted to the ideals of the liberty. 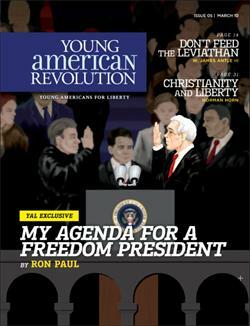 * This essay originally appeared in Young American Revolution, the magazine of Young Americans for Liberty.